around a filling (as in ravioli or wontons). The dough can be based on bread, flour, or potatoes, and may be filled with fish, meat, sweets, or vegetables. They may be cooked by boiling, frying, simmering, or steaming. For Agrikultura Triennial, I have created a dinner performance/workshop called, “Universal Dumpling.” This performance/workshop is an extension of my ongoing painting practice where I explore identity, feminism and transnationalism through colorful still lifes of brand name junk foods and exotic fruits and vegetables from ethnic markets. Through these paintings, I explore how the consumption and advertising of food is both culture specific and universal. “Universal Dumpling” is a natural and tasty extension of this investigation not just because dumplings are fun, uncomplicated and wonderfully satisfying food with protein, vegetable and seasoning all wrapped in a tidy bundle of starch. 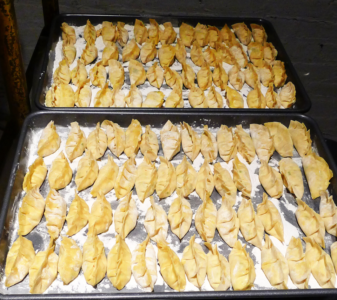 I also chose dumplings as the vehicle for cultural and political exploration because of their universality and cultural specificity: nearly every culture on Earth makes them, but the beauty and the fun lies in the culturally specific variations (ravioli, banku, wonton, mandu, gyoza, kachori, momo, empanada, pastéis and on and on). Dumpling is also kind of food that seems complicated and also wrapped in memories and nostalgia. 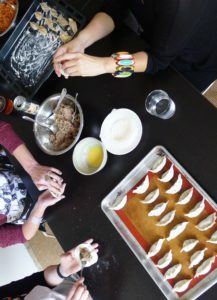 Many of my childhood memories are watching my mother and grandmother at the kitchen table with other female relatives and friends, working together to make hundreds of dumplings for special family feasts. Like Quilting Bees in American, these kitchen table gatherings were where disenfranchised women in patriarchal societies came together to share memories, knowledge and information to overcome their political isolations. 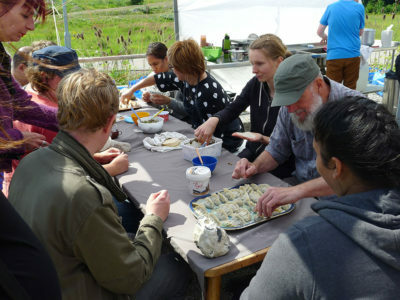 Through a series of workshops for making some Asian style dumplings, participants will be encouraged to share food memories to reveal and clarify cultural identities.